This is a great recipe from Emeril that is as beautiful to serve as it is tasty. The potatoes are very easy to prepare and the orange shells add some Thanksgiving color to your dinner plates and makes the potatoes easy to serve. Preheat oven to 400. Place potatoes on a baking sheet and bake about 1 hour until tender. Remove from oven and let rest until cool enough to handle. Reduce oven temp to 350. 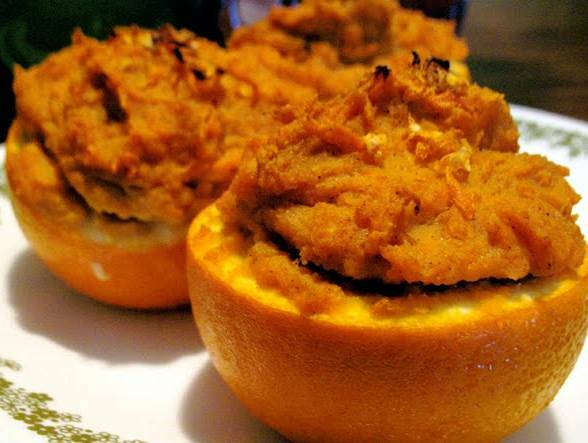 Cut oranges in half and scoop out the pulp, to make a serving "cup". Sprinkle the orange shells with a dusting of cinnamon and sugar and set aside.